And the carnival is here! The most colourful celebration of the year arrives next February 7 to fill the streets with music, dance and joy. Spain is one of the European countries with the largest Carnival tradition. If there is one region that still keeps alive many ancient traditions in both parades and gastronomy, this is Galicia. In this newsletter you have everything you can see and taste if you choose to live your Carnival surrounded by nature, magic, humor and traditional delicious recipes. The Galician Carnival is called Entroido and in it there are three locations in the province of Ourense tha concentrate all the attention because of their characteristic costumes and varied cuisine which make visible the great craftsmanship behind this traditional festival. First of all we find Verín, a municipality where stands the cigarrón costume, a character wearing a colourful handmade dress of 25 kilos and fitted with a whip with which he/she “punishes” those who cross his/her path or disrespect him/her. Another village with a famous Entroido is Laza. In this case, the most famous character is called peliqueiro referring to the skin hanging from the back of his mask, very similar to the cigarrón. This is a celebration considered a Galician Festival of Tourist Interest. The Carnival triad is completed by the town of Xinzo de Limia, a place known for having the most ancestral Entroido in Galicia and the most durable lasting five weeks. Xinzo’s most famous characters are the pantallas, whose function is to ensure that all the people in the street are disguised. Along with Verín, it is recognized as a Festivity of National Tourist Interest. Desserts become the most relevant gastronomic elemen in the Entroido. 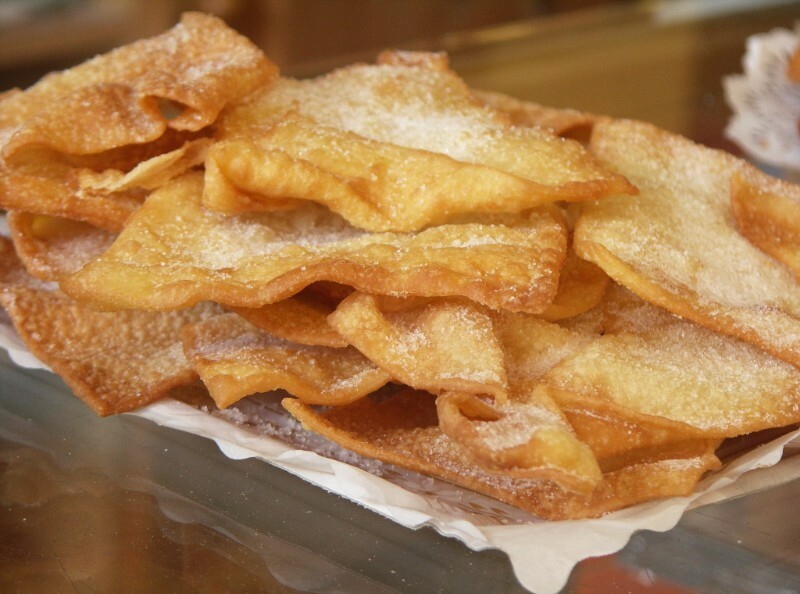 The filloas (very similar to crêpes), the orejas de Carnaval (a typical Carnival pastry) and the fritters are the three culinary badges at this time of the year. As for savory recipes, you can taste the strong Galician stew, made with chickpeas, potatoes, meat and vegetables.